In eighteenth-century Germany, the impetuous student of philosophy who will later gain fame as the Romantic poet Novalis seeks his father's permission to wed his true philosophy -- a plain, simple child named Sophie. The attachment shocks his family and friends. This brilliant young man, betrothed to a twelve-year-old dullard! How can it be? 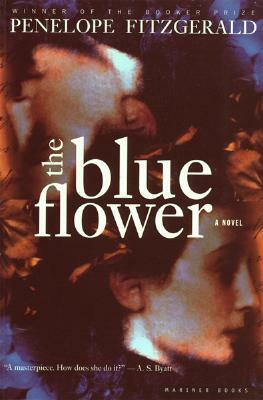 A literary sensation and a bestseller in England and the United States, The Blue Flower was one of eleven books- and the only paperback- chosen as an Editor's Choice by the New York Times Book Review. The 1997 National Book Critics Circle Award Winner in Fiction. The blue flower—die blaue Blume—has long been a symbol of Romantic yearning. What is the meaning, in the novel and in Fritz’s life, of the blue flower, and of The Blue Flower, Fritz’s unfinished writing? How do Karoline, Erasmus, Sophie, and the Mandelsloh react to the opening chapter of Fritz’s Blue Flower? How closely does Fitzgerald follow the facts of Friedrich von Hardenberg’s (Fritz’s) life? Why does she focus on the years prior to his becoming Novalis, the poet and man of letters? How does she present him as a genius in the making? Is her portrait credible? How can we explain Fritz’s sudden, irrational love for the plain, twelve-year-old Sophie von Kühn? What about the girl attracts him so powerfully? Is Sophie a repository of Fritz’s Romantic ideals and aspirations? Does he project upon her his own thoughts, beliefs, and feelings? What is the significance of his insistence on Sophie’s resemblance to “Raphael’s self-portrait at the age of twenty-five”? Fritz approaches mining as “not a science, but an art.” What does he mean? Are there conflicts that arise from Fritz’s chosen vocation as a poet and his work in the Directorate of Salt Mines? In the first chapter, Fitzgerald writes that “Impatience, translated into spiritual energy, raced through all the young Hardenbergs.” How are impatience and spiritual energy revealed throughout the novel, in relation to individual characters and to their times? With what consequences? The philosopher Fichte proclaims: “We create the world not out of our imagination, but out of our sense of duty. We need the world so that we may have the greatest possible number of opportunities to do our duty.” How important to Fitzgerald’s characters is the concept of duty? Which characters most embody a sense of duty? In his report to the Freiherr on Fritz’s behavior at the school at Neudietendorf, the Prediger “explained that Fritz perpetually asked questions, but was unwilling to receive answers.” Is this characterization true of Fritz throughout the novel? If so, with what consequences for himself and others? The artist that Fritz asks to paint Sophie’s portrait says, “In every created thing. . . there is an attempt to communicate. There is a question being asked. . . I could not hear her question and so I could not paint.” Why can Fritz hear Sophie’s question, but the painter can’t? How does this relate to Fritz’s Blue Flower? In the Weissenfels churchyard, Fritz comments to himself, “The universe, after all, is within us. The way leads inwards, always inwards.” What does Fritz mean? Is this idea evident in other characters’ thoughts or actions? For all his strengths and accomplishments, Fritz exhibits specific weaknesses, failures of feeling and understanding, and instances of ignorance. How are these revealed, especially in his relationships with the women in his life: his mother, Sidonie, Karoline Just, Sophie, and the Mandelsloh? Are they as evident in his relationships with men? What does Fritz mean when he insists that “women are children of nature” and “nature, in a sense, is their art” and that “We [men] are morally better than [women] are, but they can reach perfection, we can’t”? How does Fitzgerald represent the juxta-position of, on the one hand, women, Nature, and perfection and, on the other, men, morality, and the practical world? Of Fritz’s circle of friends in Jena, Fitzgerald writes: “They were all intelligent, all revolutionaries, but since each of them had a different plan, none of it would come to anything.” How does this judgment place the Jena circle within the wider milieu of late-eighteenth-century Germany and Europe? What are the most important features of that milieu, that Zeitgeist? Do the “uncertainty and expectancy” that “moved among the guests” at Fritz and Sophie’s engagement party constitute an accurate description of a society on the verge of revolutionary change? On Fritz’s first visit to the home of Kreisamtmann Coelestin Just, he experiences a “transfiguration.” What other transfigurations does he experience and what is their nature? What is the relationship between these moments of transfiguration and everyday life? Fitzgerald tells Novalis’s story in fifty-five brief chapters, which have been likened both to movements in a sonata and to a series of pictures. Which analogy seems more fitting—a musical pattern of movement and countermovement or a gallery of portraits and landscapes? As Sophie approaches death at Grüningen, Fritz pleads with the Mandelsloh to answer his question “Should I stay here?” The Mandelsloh responds, “If you stayed here, you would not be wanted as a nurse. . . You would be wanted as a liar.” What are the full implications of her statement, and why does Fritz decide to leave? Near the end of the novel, Fritz writes in his journal: “As things are, we are the enemies of the world, and foreigners to this earth. Our grasp of it is a process of estrangement.” What does Fritz suggest here and how do these sentiments relate to his own life? Fitzgerald writes that Fritz had learned, as a child at Neudietendorf, “Chance is one of the manifestations of God’s will.” How does chance play a significant role in the novel? Is it a manifestation of God’s will? After reading the opening chapter of The Blue Flower to Sophie and the Mandelsloh, Fritz comments, “If a story begins with finding, it must end with searching.” Who is searching, and for what, throughout the novel?